Madison Davis (chief, postage stamp division, 3rd Assistant Postmaster General); Mrs. George R. Ruff. Madison Davis (chief, postage stamp division, 3rd Assistant Postmaster General). C. G. Calkins (Hydrographic Office). Madison Davis (chief clerk, 3rd Assistant Postmaster General). Madison Davis (chief clerk, 3rd Assistant Postmaster General); Elizabeth A. Smith (servant). Albert G. Ruff (clerk, city post office); Sarah J. Ruff (widow of George R. Ruff); Wesley G. Carr (teacher). Frank A. Smith (clerk, Pension Office). William B. Marlow (clerk); Frank A. Smith (clerk, Pension Office). Frank A. Smith (clerk, Pension Office); William B. Marlow (clerk). Alida J. Gaynor (housekeeper); Thomas S. Moore (Moore & Leding). Franklin Moore (clerk); Thomas S. Moore (Moore & Leding). Thomas S. Moore (Moore & Leding); Franklin Moore (clerk). Phyllis M. Gross (widow of Horace Gross); Angelina A. Marshall (widow of Ezra A. Marshall). Harry N. Low (Graham & Low); Elvira Scott (nurse); Angeline Marshall (widow of Ezra A. Marshall). Elizabeth J. Bock (teacher); Fred M. Bock (clerk, city post office); Irene B. Bock; George W. Bock (clerk); L. Ellsworth Bock (clerk, city post office); Magdalene C. Bock (teacher); Mary A. Bock (widow of Max Bock). Elizabeth J. Bock (teacher); L. Ellsworth Bock (clerk, city post office); Mary A. Bock (widow of Max Bock). Elizabeth J. Bock (teacher); George W. Bock (fireman); Magdalen C. Bock (teacher); Mary A. Bock (widow of Max Block). Elizabeth J. Bock (teacher); Irene B. Bock (teacher); George W. Bock (fireman); Madalene C. Bock (teacher); Mary A. Bock (widow of Max Bock). George M. Buck (clerk, Capitol); William J. Jones (painter); Clara H. Jones (Census Office). Clara H. Jones (Census Office); William J. Jones; Charles A. Conrad (chief clerk, office of Fourth Assistant Postmaster General, Post Office Department). Arthur F. Bauer (bookkeeper); Bessie K. Bauer (bookkeeper); Henry Bauer (tailor). 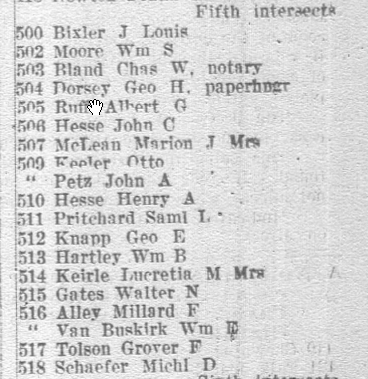 William R. Baker (clerk, Census Office); Arthur F. Bauer (bookkeeper, secretary of the Regina Elena Pleasure Club); Bessie K. Bauer (bookkeeper); Henry Bauer (tailor). Arthur F. Bauer (assistant secretary). 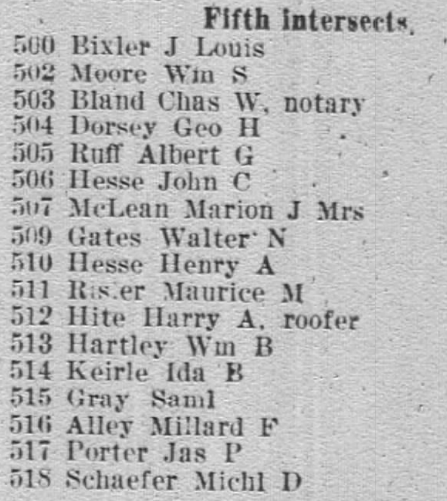 Henry Bauer; Bessie K. Bauer (bookkeeper, Remington Typewriter Co., boards); Byron Richards (clerk). Bessie K. Bauer (stenographer, Robert C. Rogers Co.). Juliet C. De Courcy [sic] (nurse); Lulu Konkle (stenographer). Elizabeth C. DeCourcy (stenographer); Jennie DeCourcy (widow of Matthew DeCourcy); Juliet E. DeCourcy (nurse); Mary DeCourcy (clerk). Elizabeth C. DeCourcy (clerk, War Department); Jennie DeCourcy (widow of Matthew DeCourcy); Juliet E. DeCourcy (nurse); Mary DeCourcy (clerk). Mrs. Jennie DeCourcy; Juliet DeCourcy (nurse); Myrtle Settle (nurse). Franklin Moore (jeweler); May B. Hilliard; Newton Hilliard (coal); Tyrus Christman (toolmaker). Franklin Moore (clerk); Newton Hilliard (coal). Capt. Benjamin F. Day USN (Naval Examining Board); Clement Hilliard (student); May Hilliard (student); Newton Hilliard (coal). Capt. Benjamin F. Day USN (Naval Examining Board); Hugh C. Mitchell (Coast and Geodetic Survey). Rear Admiral Benjamin F. Day (U.S. Navy, Naval Examining Board). Daniel P. Wright (machinist); N. Hilliard (coal). C. B. Hilliard (secretary and treasurer, East Washington Heights Railroad Co.); Clement B. Hilliard (bookkeeper); Newton Hilliard (Bureau of Printing); Guiseppe Pizza (clerk). Philander B. Carlisle (Navy Yard); George E. Gardner (Navy Yard); Clement B. Hilliard; Newton Hilliard (laborer). George R. Brooks (draftsman, Navy); Clement B. Hilliard (bookkeeper); Newton Hilliard (Government Printing Office). Clement B. Hilliard (bookkeeper); Newton Hilliard (Government Printing Office). Clement B. Hilliard (bookkeeper, Commercial National Bank, boards); Newton Hilliard (laborer, General Post Office). Clement B. Hilliard (clerk, Commercial National Bank): Newton Hilliard. Clement B. Hilliard (clerk); Newton Hilliard. Nancy Lane; Grace C. Underwood. Hanora [sic] Fitzpatrick (widow of Michael Fitzpatrick). John T. Tyler (clerk); Mary A. Tyler (widow of Charles S. Tyler); George Y. Thorpe (stonecutter). Susan C. Ayres (Coast and Geodetic Survey). Susan Ayres (Coast and Geodetic Survey). Susie C. Ayres (clerk, Pension Office). John M. Kenney (sergeant, police); William S. Moore (bookbinder). William S. Moore (Government Printing Office). Edith S. Moore (teacher); William S. Moore (Government Printing Office). 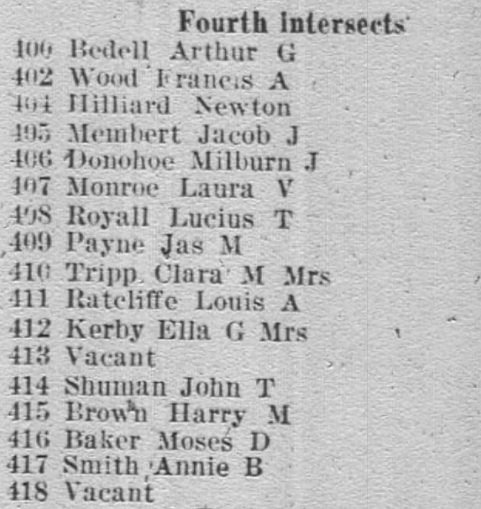 Edith S. Moore (teacher); Edward John (driver). 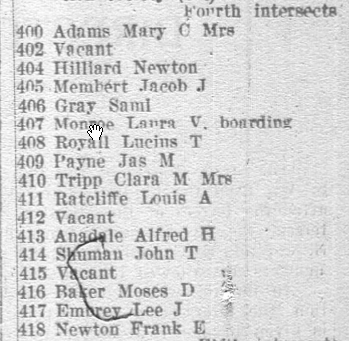 Federal census, 1940, 517 A St., S.E., Washington, D.C.
Solomon J. Lewis (renter, $26), head, 22, married, completed 8th grade, born in Fla., lived in same place in 1935, counter-man at restaurant, worked 26 weeks in 1939, income $364. Louise V. Lewis, wife, 17, married, completed 3 years of high school, born in Va., lived in same place in 1935, not employed. Charles B. 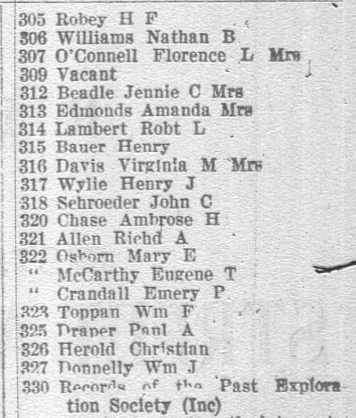 Bell (renter, $30), head, 26, married, completed 7th grade, born in Tenn., lived in same place in 1935, butcher, retail grocery, worked 16 weeks in 1939, income $288. Elizabeth F. Bell, wife, 34, married, completed 1 year of high school, born in Sweden, not at citizen, lived in same place in 1935, laboratory worker, wholesale [illegible word], worked 28 weeks in 1939, income $460. Andrew C. Bell, son, 2, born in D.C.
William T. Moore (renter, $32), head, 30, married, completed high school, born in Va., lived in same place in 1935, apprentice rodman, building construction, worked 52 weeks in 1939, income $1,900. Ethel M. Moore, wife, 30, married, completed 8th grade, born in Penn., lived in same place in 1935, not employed. Jack L. Hughes, stepson, 10, completed 2nd grade, born in D.C., lived in same place in 1935. 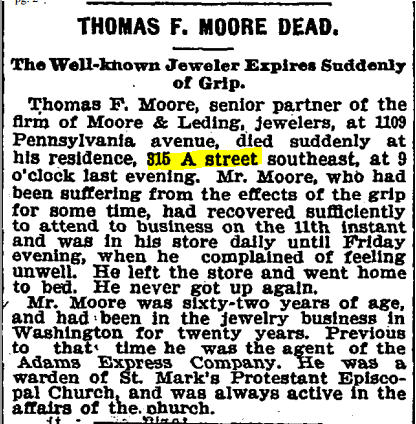 Washington Post, 24 December 1893, p. 2. “Normal School No. 1 Programme and Exercises.” Washington Post, 12 June 1906, p. 5. 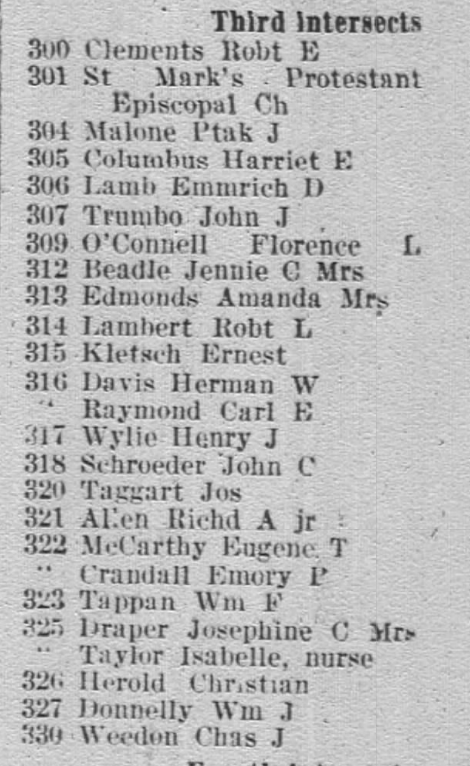 Edith S. Moore, 502 A street southeast, graduated from Normal School No. 1.